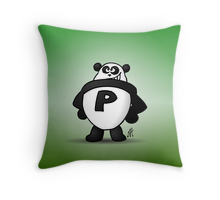 Many a lover of sitting softly and lying down, allready knows about the throw pillows by Cardvibes. You bought them at Zazzle and Society6. Recently there is also Cardvibes throw pillow range at Redbubble. So if you are looking for a throw pillow with a ballerina, a pillow with a garden gnome or whatever, take a look at Cardvibes throw pillow department at Redbubble.